• Fully welded frame with 25mm square tubular legs. • Wide selection of sizes & shapes. 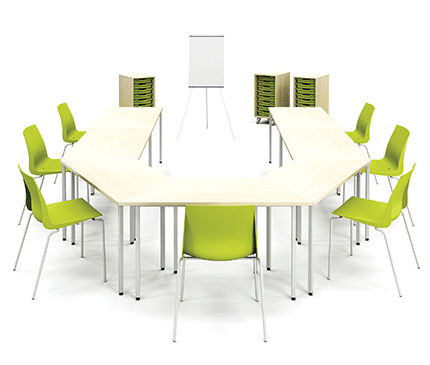 • Height options (ideal for classroom use). • Optional MFC or LF MDF tops. 460, 530, 590, 640, 710, 727 & 760mm high (standard). 25mm MFC with 2mm ABS edging. Available in apple, ash, autumn cherry, beech, english oak, grey, light oak, maple, pear, verade oak, walnut or white. 20mm laminated MDF with bull-nosed and lacquered edging. Available in white, grey, maple, beech, blue, yellow, green or red. 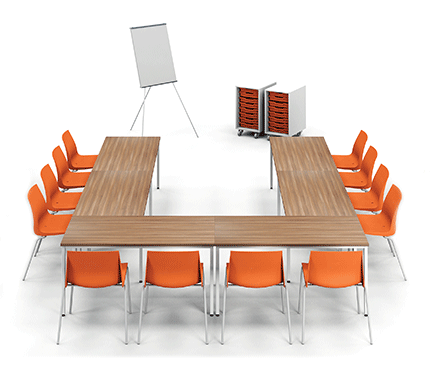 Solid grade laminate tops are available for all tables. Price & finish availability on request. Volume discount available for quantities of 25 or more. Click on the links below to download digital media for Basix.